Yay, today is the day! 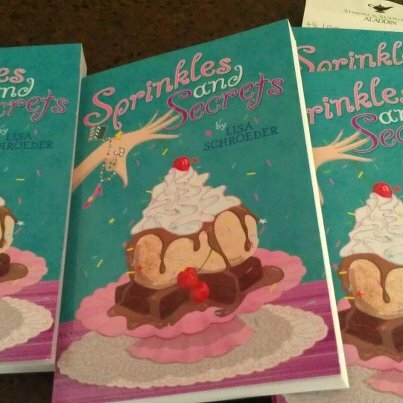 For only $6.99, the paperback of Sprinkles and Secrets can be yours!! That's like less than a price of a large pizza. Well, most of the time. It's less than the price of a movie ticket and a small popcorn! And you can keep it and read it over and over again, as many times as you want. What a deal, right? The cool thing is that even though Frosting and Friendship wasn't quite finished when the paperback needed to go to print to be ready in time, the first chapter was finished, So, the first chapter of Frosting and Friendship is in the back of the paperback version, and will give you a good idea of what the new book is about. You definitely get to find out who the main character is, see how she's quite different from Sophie and Isabel, and at the same time, see Sophie and Isabel in that first chapter too. If you've read it, I hope you'll tell your friends about it. Thank you!!! Can a sense of fashion be learned?